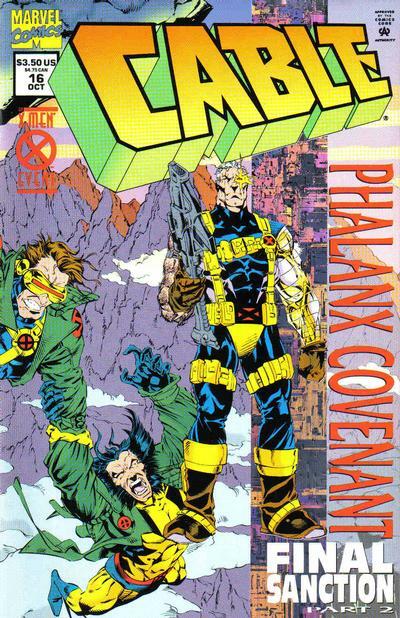 "Final Sanction" concludes this issue, and with it the "Phalanx Covenant: on the whole, as the X-Men are freed and the Phalanx destroyed, in part thanks to the help of Lang, who intervenes to spare humanity from the threat of the Phalanx, who have grown beyond his initial directive to target mutants. This issue also marks the end of Lang and Hodge for the time being, though both will return (in techno-organic form) in the third volume of X-Force and factor in to "Second Coming" (proving once again that N'astirh proved good to his word when he promised him eternal life). 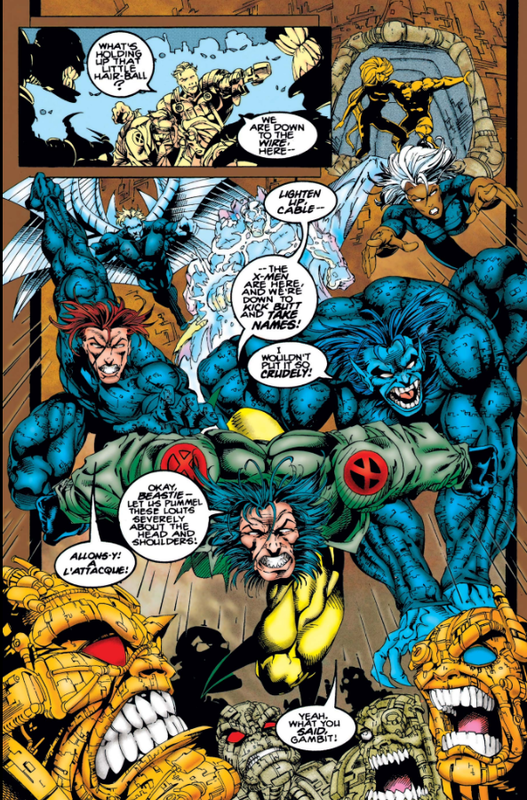 The (actual) X-Men make their first (and only) appearance in the crossover in this issue. This is the issue that sticks in my mind as the one where the distinction between Wolverine having bone claws instead of metal ones is mostly lost, as he’s able to use his claws to help climb a mountain by sticking them into solid rock, which seems like something that should just shatter them instead. The story concludes with a brief cliffhanger/tease, in which an extra-galactic techno-organic being promises to become more involved in the mission against Earth, but as far as I know, nothing ever comes of this (the Phalanx will return, specifically in space-based stories, towards the end of the Lobdell/Madureira run in Uncanny and even later as the central antagonists of the "Annihilation: Conquest" crossover amongst Marvel's cosmic series, but neither story makes any direct reference to this figure). 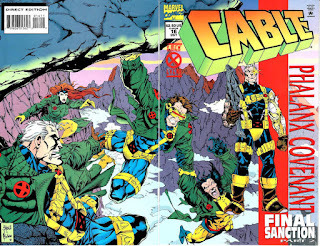 The variation on the blue/yellow X-Men training uniform (tricked out with extra pouches) that Cable wears in this issue, will become his standard look in this series (and eventually X-Force as well) for the next several years, representing his closer ties to the larger X-family. 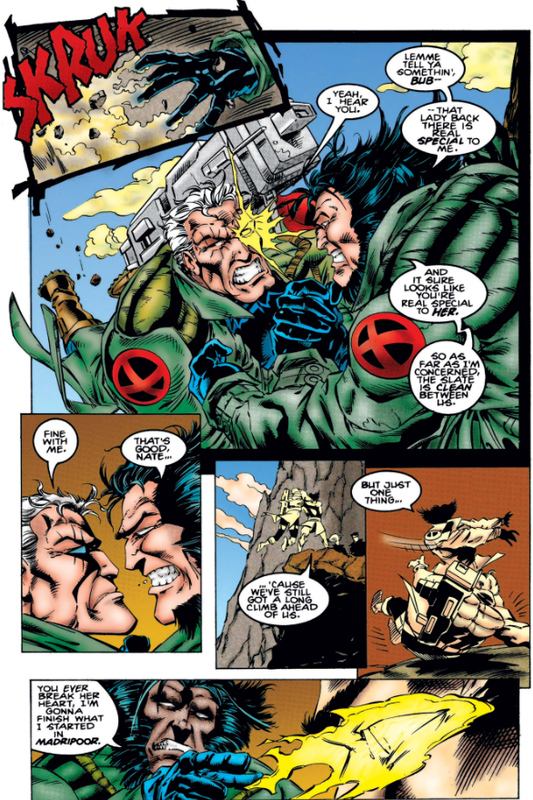 In light of Jean’s clear concern for Cable, Wolverine settles the differences between the two of them (something that seemed to have been resolved when they were hanging out and not arguing during “X-Cutioner’s Song”), though he says if Cable ever hurts her, he’ll finish what he started in Madripoor (a reference to New Mutants #93-94). 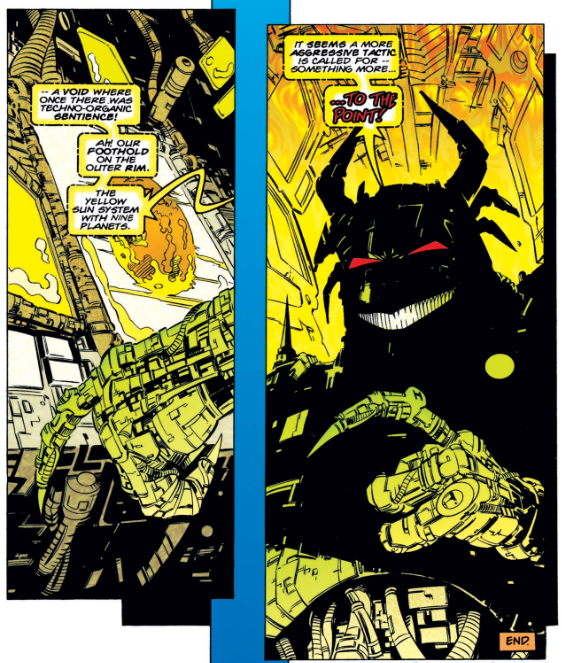 The techno-organic tendril seen grasping at Wolverine’s plane at the end of Wolverine #85 leads Hodge to realize the plane had been at Muir Island. The action-packed finale to both "Final Sanction" and the larger "Phalanx Covenant" is a touch perfunctory, with the ultimate defeat of the Phalanx reliant on a tad too much techno-babble, but it still manages to hit all the right notes, focusing on the quartet introduced in Wolverine #85, while also working the captive X-Men into the ultimate defeat of the Phalanx, all ably and energetically illustrated by Steve Skroce. Wolverine's disdain for Cable seems forced (and out of nowhere), not really present in the previous chapter (nor much at all even prior to that, unless we go a ways back), but it does add to the overall "kooky family" feeling that permeates "Final Sanction" (making Wolverine here something like a cross between a cranky father & protective brother, I suppose). As for "Phalanx Covenant" as a whole, it's ultimately, 2/3 a good crossover, math that is made easier by the decision to so distinctly divide the story into thirds. "Generation Next" is the clear standout, managing to both effectively setup Generation X while also telling an entertaining story in its own right (Lobdell & Madureira's horror-tinged setup and Gen X "pilot" issues in particular are great; the Nicieza/Kubert chapters function more in service to the plot). 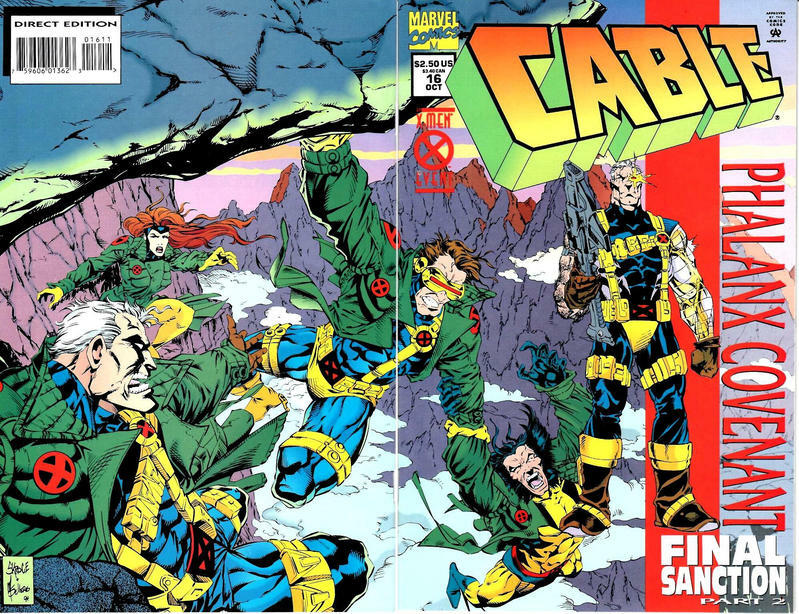 But "Final Sanction" isn't bad, either, providing the kind of high-octane action readers have come to expect from these crossovers, while also being notable for reuniting Wolverine with the X-Men (briefly), and reuniting Cable with Cylcops & Phoenix for the first time since the latter returned from raising the former in the future (comics are awesome). Of course, "Life Signs" is the dud of the group, thanks, mostly, to being exceedingly boring, but also because it traps the characters it features in a narrative cul-de-sac, removed from the larger "Phalanx" plot, and then further sidelines its character in favor of a smaller core group. 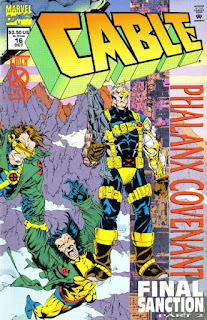 Overall, "Phalanx Covenant" is easy to overlook, coming as it does after the momentous (if messy) "Fatal Attractions" and before "Age of Apocalypse", which just completely rewrites what's possible for these kinds of events in terms of scale (both of which also feature significant X-Men villains at their centers), with its biggest legacy being the launch of a new X-book (which, as the line's eighth, is isn't all that momentous). It is good but not great, narratively-significant but not important, structurally unique but somewhat lessened by that structure. If, as crossovers go, it's generally overlooked by X-fans, there's good reasons, even while there's also reasons that it deserves a second look. Ultimately, that dichotomy might be the story's most defining legacy. Next week: Uncanny X-Men #318, X-Factor #108 and Wolverine #87. - Saves the X-Men from being killed by Onslaught in "Onslaught". I suspect all of this is a large part of why Bishop made such an impact on me in the 90s, cementing him as one of my favorite X-Men. Whenever something big was happening, he was involved and doing something cool in some capacity. Heck, he and Psylocke are the only X-Men outside of Cyclops, Jean, Wolverine, Banshee and Jubilee who do anything cool at all in all of "Covenant"! It is interesting just how integral to stories in a certain span of years Bishop was. I've always felt like Bishop lost a little something after "Onslaught" (after he succeeded in averting his timeline), but the decline in his profile was even steeper, given how deeply he was seeded into some pretty significant stories beyond "Onslaught". Y'know -- it's really kind of weird to think about it since he's not considered a core character in the same way as the original five, the "Second Genesis" group, Kitty, or even Rogue or Gambit, but I basically grew up with Bishop as a high profile, major A-list X-Man. He was already on the team when I started reading in middle school, and he remained a member all through those years, and through high school as well. And thanks to the "reverse sliding timescale" of childhood, those six or seven years felt way longer at the time than six or seven years feel today -- but in reality, Bishop's time as an A-lister was pretty short and sweet. Sure, he's been around since then in various series and capacities, but (perhaps aside from Claremont's X-TREME X-MEN) he's never felt as indispensable as he did for that brief (in actuality) run. I had a strange hunch it didn’t. The issue’s resolution is already on the abrupt side, and the fact that the last panel adds to that by feeling confusingly like a cliffhanger, when the story is actually over, gets made even worse if said last panel isn’t ever followed up on. this is the only time cameron hodge dies for good because later Bastion says it has resurrected!